Husain Limdiyawala October 17, 2017 October 17, 2017 Astronomy, Did you know? In my previous article “How it all started…”, I expressed on how a star fuse elements of our periodic table in its core. Also, how star cannot fuse iron and it leads to a big supernova explosion. The question arises, If this is true how do we find elements in periodic table which are higher then Iron are produced? For e.g. Gold, Lead, Plutonium, etc. In my article “The legend of the black hole”, I expressed how a star bigger then the size of the sun turns in to either a neutron star or a black hole after supernova explosion. To be precise, a star with size of 4 to 8 times that of the sun at the time of supernova explosion collapse drastically due to gravity that its outer layer blows off and what remains is a high gravity tightly packed material. This material is so dense that protons and electrons combine to make neutron and thus its name i.e. Neutron star. Around billions of years ago, 2 such stars, 4 to 8 times greater then Sun ran out of fuel in its core while fusing iron leading to supernova explosion. The remnants of these 2 stars turned into 2 Neutron stars, rest blowed off particles led to the formation of our solar system. These 2 neutron stars got pulled to each other and revolved around each other due to high gravity pull and heavy mass that can dent the fabric of space. Ultimately, they collided with each other in a massive kilonova explosion forming heavier elements in periodic table like Gold. 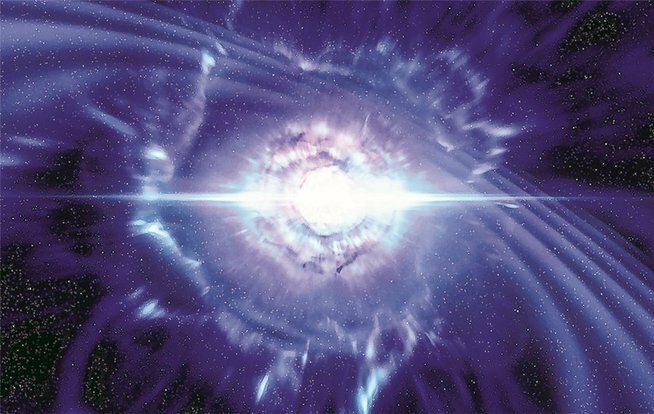 A neutron star can be about 1.5 times the mass of our sun however, its size is nothing more then any metro city!! The collision can create matter like Gold of the size of Jupiter planet!!! This theory though plausible on paper did not have any real evidence. However, yesterday something remarkable happened. Scientist observed / heard neutron star collision that happened around 130 million light years from our planet. All thanks to LIGO. It gives me goosebumps when i think that the gold ring my mother wear has such a cataclysmic origin.